A festival which attracted thousands of visitors into Aberdeen is to return to shine new light on the north-east’s past. Spectra, Scotland’s biggest urban light festival, attracted more than 35,000 visitors to the Granite City last February. This year’s four-night event – bringing together leading international artists and established Scottish collaborators – will celebrate the nation’s year of history, heritage and archaeology by exploring the city’s past. Huge light spiders will scale the gravestones in the Kirk of St Nicholas as part of a light installation entitled Les Araignees, which is a tribute to Robert the Bruce, and Marischal College will be transformed into an enormous interactive musical instrument. Union Terrace Gardens will also be at the very heart of the festival taking place from February 9-12. Organised by Curated Place and Aberdeen City Council, the free event invites audiences to engage with playful, accessible and high quality performances, spaces and works of art using light, sound and interactive experiences. The 2016 event was named Scottish Festival of the Year and organisers aim to build on that success. 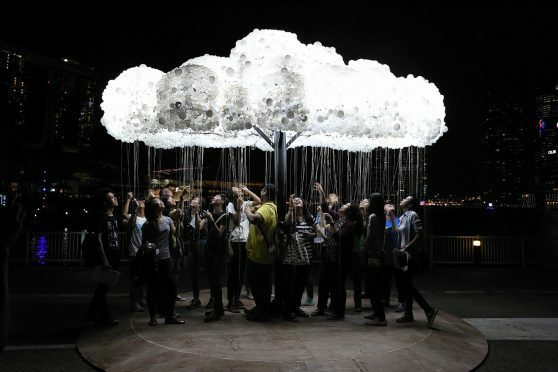 Highlights will include Caitlind Brown and Wayne Garrett’s internationally-renowned CLOUD sculpture, a tribute to Scotland’s most ubiquitous invention – the incandescent lightbulb. Councillor Marie Boulton, deputy leader of Aberdeen City Council, said the festival promised to “bring the city to life in February”. She added: “Spectra is one of the most eagerly anticipated events on what is a growing events calendar in Aberdeen. “The 2016 festival was hugely successful, engaging with local audiences as well as attracting visitors from throughout Britain and overseas. “We’re proud to be bringing Spectra back to Aberdeen, another big step towards establishing the city as a destination with a rich cultural offering. “Aberdeen is undergoing great transformation at present, with significant development linked to our comprehensive city centre masterplan, and those physical changes are central to our ambitions for the future.